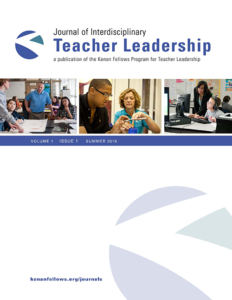 The Journal of Interdisciplinary Teacher Leadership (JoITL) is a peer-reviewed publication featuring original work on educational topics from research to pedagogy to policy and beyond. It is grounded in the belief that education benefits from diversity of thought and the crossing of disciplinary boundaries. With this in mind, JoITL is designed to engage the scholarship of a wide cross-section of education professionals and provide a space for sharing both research and practice. The five articles in this inaugural edition well reflect the vision of diversity and inclusion in which JoITL is grounded.